Bigotry, classism, elitism, hatred, and all the other ills of our times are exacerbated by unjust distribution of resources. When someone has — or appears to have — the ability to give a resource to someone in need of that resource, that’s when societal ills go from quirks to conflicts. When a family is starving for want of bread, they don’t simply rob the nearest baker. They choose the baker most different from them. When faced with the opportunity to hire someone and uplift them from poverty, an employer chooses the applicant with which they most empathize. It’s hard to turn away someone that looks like they could be your son, or daughter, or even you from a different life. Without scarcity — without need — these conflicts would not become violent. Without scarcity — whether that scarcity be of rights or resources — bigotry goes without harmful expression. Without scarcity, we can afford to tolerate bigotry. Star Trek: The Next Generation and the original series both faltered when faced with a specific conflict. Two groups which dislike each other are fighting over a limited resource. Often there has been some wrong-doing, misunderstanding, or ancient enmity that results in a conflict. In the end, the crew of the Enterprise broker an end to hostilities. Take “When the Bough Breaks” as an example. An elusive nation kidnaps children because they can breed none of their own. The Enterprise, ready to fight to get back its stolen people, discovers the cause of the nation’s infertility. They present the solution to the people of the nation, and peace is attained. The children are returned. This sort of solution appears time and again throughout many Star Trek series, but it is the most false of hopes. An acute problem on the edge of spilling out into violence, is resolved by the clever intervention of technology. Yes, drama still occurs, but the scarcity which caused the conflict is alleviated. This is what it means to “Star Trek” your way out of a problem, and it rarely works in real life. Technological solutions always target the suffering of the rich. When the poor are considered, they are but a market from which the rich can benefit. Heroes who seek to solve the world’s problems with only technology, will only succeed in widening the gap between the wealthy and those that suffer the most. Technology can cure a great variety of ills. Those who market technology as a cure-all are either grifters or marks. Brilliance — and the greater continent of Promise — is filthy with the fantastic. The Soaring Scar — the home of the Raptors — is a mountain range that floats above a boiling ocean. The walkwoods of Promise will march upon cities and towns to drag away sinner and saint alike. And, barring misadventure, the people of Brilliance live forever. All this magic — well, most of this magic — is due to the influence of alchemy, and it is bound by alchemy’s limitations. Alchemy cannot bring the dead back to life. Alchemy cannot make barren lands grow food. Alchemy cannot provide energy from nothing. All energy on Promise comes from somewhere. Resources are always limited. Reagents and the knowledge of how to use them are scarce. Perhaps the most contentious resource is the possession of the iron wells themselves. While iron water is most central to the people of Brilliance, there are other forces in the world that rely on it as well. Unlike Star Trek or other utopian fictions, Seven Days a Servant does not present a technology which cures scarcity. In fact, all fantastic technologies on Promise increase demand for its scarce resources. As Brilliance moves ever-closer to revolution, no technology is going to save them. They can’t Star Trek their way out of their problems. Whoever lives to tell the story of Brilliance, they won’t recall the magical solution which brought salvation on the dawn of their darkest day. Peace will be won with negotiation, compromise, and blood. 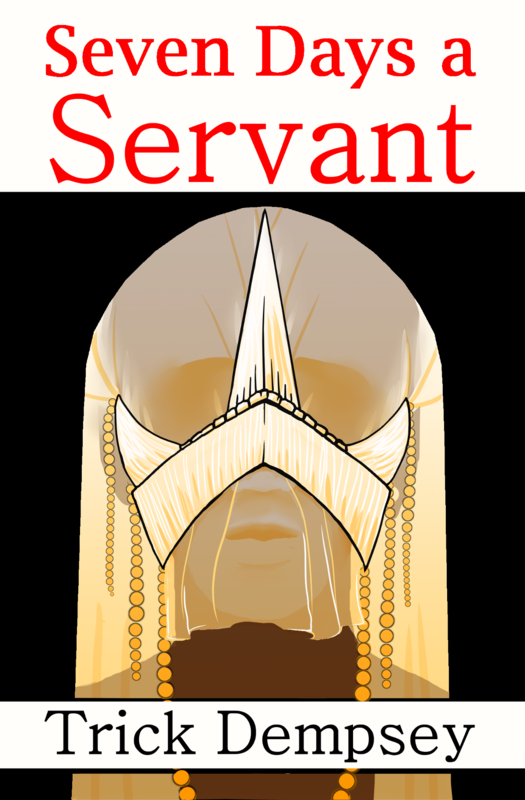 Take part in crowdfunding Seven Days a Servant by pre-ordering on its Inkshares page! Let’s make this happen!